The term “oligarchs” may well be added to the growing list of banned words list at the tax evasion and bank fraud trial of former Trump campaign chairman Paul Manafort. As the second day of Manafort’s trial got underway Wednesday, U.S. District Court Judge T.S. Ellis III indicated he was worried that referring to the businessmen who funded Manafort’s political work in Ukraine as “oligarchs” had the tendency to suggest that the defendant was engaged in shady and unsavory work. Ellis said that if the term simply meant a wealthy person, it might not be objectionable. “Well, Mr. Soros would be an oligarch by that definition, and so would Mr. Koch, but we wouldn’t call them that,” the judge said, referring to politically active American billionaires George Soros and, apparently, to either Charles or David Koch, or perhaps both. “The word ‘oligarch’ has come to have a pejorative meaning about which there will be no evidence in this trial,” the judge said. “We don’t call American businessmen oligarchs. Ukrainian businessmen are referred to as oligarchs. Those are the facts,” Andres said. Ellis interrupted to disagree. “Those are not the facts of this case,” he snapped, saying that any witnesses using the term would be offering an opinion. Prosecutors used the term repeatedly in opening statements Tuesday, saying that a number of Ukrainian oligarchs paid a total of more than $60 million to back Manafort’s work in Ukraine on behalf of President Viktor Yanukovuch and his Party of Regions. 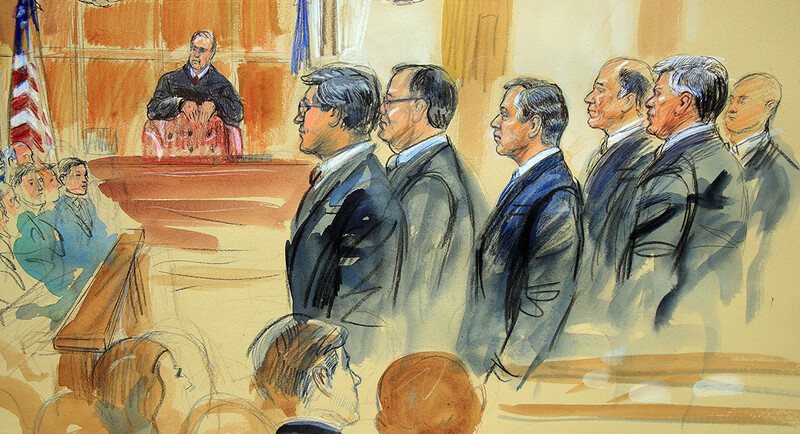 A prosecutor caused a scramble in the courtroom just after noon Wednesday by suggesting that Rick Gates, the longtime Manafort protege who took a plea deal and is often billed as the government’s star witness, might not take the stand at all. However, the move appeared to be not so much a blockbuster reveal as a feint aimed at getting more leeway from the judge to admit into court proceedings financial documents the FBI seized from Manafort’s condo last year. “You’re going to offer Mr. Gates, aren’t you?” Ellis asked, clearly trying to move the tedious questioning along. “He may testify in this case, your honor, he may not,” Asonye said. “That was news to me and, obviously about 27” others in the courtroom, the judge said to laughter from various quarters including some jury members. Mueller’s team did reveal their afternoon witnesses during the morning proceedings. They will include include Maximillian Katzman, a business partner to one of Manafort’s lawyers; Daniel Opsut, a comptroller from Mercedes Benz in Alexandria; and Ronald Wall, whose identity isn’t yet clear. “He demanded a lot of the people who worked for him. Paul was thorough. He was strategic. He always worked for the best of the campaign. He ran a very good campaign,” Rabin said. Ellis limited prosecutors further during Rabin’s appearance, balking at efforts to introduce three photos showing Manafort with Yanukovych. The judge agreed to allow only one into evidence, suggesting that he didn’t want too much evidence showing how Manafort rubbed shoulders with the very powerful. While the judge allowed one of the photos to be admitted, when Andres asked to actually show it to the jury, the judge said tersely: “No.” So Andres moved on. Rabin said another key player in the group’s work in Ukraine was Konstantin Kilimnik, a Ukrainian-Russian citizen who took ads written in English and translated them into conversational Ukrainian. The name of one oligarch, Rinat Akhmetov, was also raised by Andres Wednesday. Rabin called Akhmetov “someone of wealth” in Ukraine and said he’d met him, perhaps in connection with a campaign Akhmetov mounted for Ukraine’s parliament. Defense lawyer Richard Westling asked Rabin if he’d done well financially in the dealings with Manafort. “Were you paid well for your work?” the lawyer inquired. “It depends on who you ask,” Rabin replied, estimating that the payments were in the hundreds of thousands of dollars. “Well, there’s no Democrats and Republicans anywhere but the U.S.,” Rabin replied. While federal authorities began investigating Manafort around 2014 and stepped up that scrutiny in the last couple of years, Rabin said he’d only been contacted by prosecutors for the first time about two months ago.